CARVICO S.P.A. & THE 2013 27TH MARATONA DLES DOLOMITES: OUR HEART, YOUR PASSION! The Maratona Dles Dolomites, of the most famous European gran fondo competitions, takes place on June 30th in the breathtaking landscape of the Dolomites mountains. Carvico S.p.A. is for the fourth year running the marathon Golden Sponsor and is proud to announce that once again it is going to team up with the 9000 athletes who are about to compete, with commitment and passion, challenging each other, climbing some of the most amazing peaks and crossing some of the passes which have made the history of cycling. The Alta Badia valley with its steep peaks and its impressive landscapes will be hosting both professional sportspeople and amateurs in one of the real must of the seasons. But the undisputed star of the day is definitely gong to be the environment itself, which has always been a top priority for both Carvico and the organizers of such event. Our business and the organisation behind the marathon have always promoted a “green spirit” and sustainability and it is from those values their concrete approach to the preservation and defence of our ecosystem stems from. And this year, more than aver before, Carvico has decided to offer concrete evidence of its ecofriendliness by producing an exclusive and limited edition of the “finisher” waistcoat to be given to all participants who will make it to the finish line. The Dolomiti Limited Edition Waistcoat by Carvico is made of 100% recycled polyester derived from post consumer plastic bottles ( PET) . – lower CO2 emissions: recycling 1000 kilos of PET means reducing free house gases emissions of 3000 kilos. 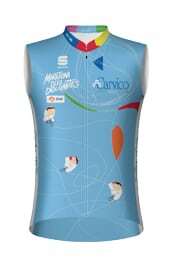 30 1.5 litre bottles can be recycled to produce 1kg of new yarn, therefore 73,534 bottles can be converted into 7000 meters of fabric so to say the amount of fabric used to create the 9300 waistcoats Carvico is going to present the Maratona Dles Dolomites with. Soft and slightly, Dolomiti limited edition by Carvico S.p.A. is not only sustainable, but also high performance. Made of a hollow fiber it is light but non see-through, breathable, insulating and highly UV protective. Its soft brush makes it particularly comfortable on the skin and creates a protective cushion which can help maintaining the body temperature steady. In addition to this, it is softness, lightness and comfort improve its areodynamic performance reducing energy consumption. Dolomiti Limited Edition is long lasting because its pilling and abrasion resistant and it is consequently ideal for sportspeople who are both demanding in terms of quality and eco-friendly. Surrender to the Dolomites mountains exclusive charm and to this year GranFondo… Come and take part in the 27th Maratona dles Dolomites with Carvico S.p.A.!